Rajasthani women have always been the object of praise for the whole of India, representing one tradition from the diverse culture of India. Their lifestyle, their dressing sense, their beauty and dance have always been a major part of tourist attraction for the entire state of Rajasthan. A major part of Rajasthan has developed to a great extent and now has many malls, industries and palatial modern Bungalows. Women too have learnt to dress keeping up with the modern fashion trends and fads. But Bikaner is one of those rare places of the state wherein the original traditional culture still has a strong foothold in terms of the lifestyle of people. The way the locals dress, celebrate festivals, live their daily life, still exudes the fragrance of the true Rajasthani culture and tradition. Women in most parts of the city and villages alike are seen dressed in their traditional attire. 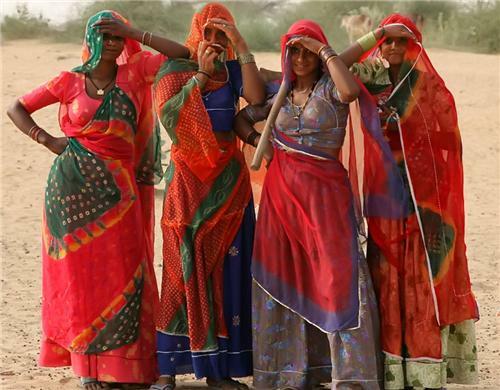 They are seen walking through the harsh desert sands of the Thar wearing ‘Mojris’ with water vessels placed on their head, sporting red and white bangles up until their arms. 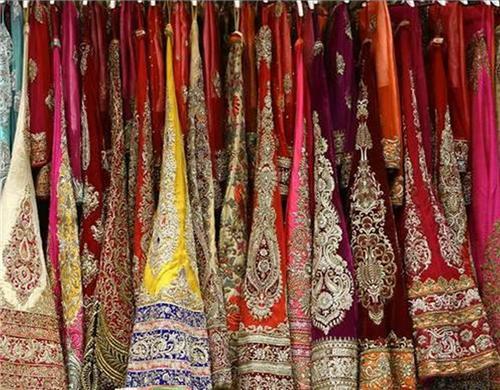 Women in Bikaner, belonging to different classes and financial backgrounds are dressed in this set of garments. Queens, villagers, huntsmen and even dancers are adorned in this attire, only different being in the cloth material, embroidery and embellishments used for them. In the earlier days, the ones worn by Queens and princesses consisted of embroidery made of gold, which is also known as Zardouzi Karigari which were further enhanced by the addition of refined and artistic yet traditional gold ornaments. Zardouzi embroidery is popular among brides across the whole of India and at times even precious gems and pearls are used for this type of hand-woven embroidery. This is what makes some of the Zardouzi Bridal attires extremely expensive and limited to a certain class of people. These embroideries are also used on Satin or silk clothing material as was the trend among the ruling Queens or princesses then. Now they are worn during limited occasions like marriages and festivals by financially well-off families or descendants of the Kings and Queens. This particular dressing style is not only limited to Rajasthan but is also quite popular in certain villages of Gujarat and even Northern India. But in northern India this is not the regular wear garment but is worn during weddings and engagement ceremonies by the Brides. Ghagra-Choli worn by the women of Bikaner represents the true culture and enhances the beauty of the blank sand deserts. It adds élan, style and grandeur to the dances of the folk dancers of the land and you must own one if you ever visit the markets of Bikaner.